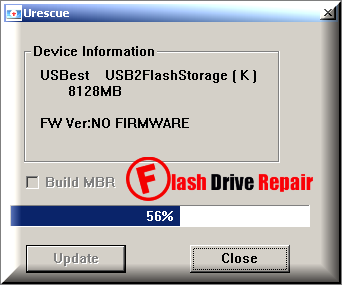 Learn how to update Usbest flash controller firmware .Download Format V2112 and Urescue v1006 recovery tools and repair corrupted USbest UT161 and USbest UT163 chip controller . USBest UT161 format tools can fix format errors such as write protection ,Raw flash drives ,unformatted flash disks and other format problems .You must determine your flash drive chip vendor first before you use these software .You can use Chipgenius software or USBDeview V2.30 utility . How to repair USbest ut161 ,ut163 chips? First download FORMAT_v2112.EXE and Urescue_v1006.exe from download links below . Insert corrupted USbest usb flash disk to your PC . First use Urescue_v1006.exe then FORMAT_v2112.EXE . You must wait until finish formatting your flash disk .